In 1954, a fellow named Francis Leroy Henning counterfeited several hundred thousand nickels dated 1939, 1944, 1946, 1947 and 1953. That may seem like an odd coin counterfeit, but it wasn't quite as insane as it sounds because a nickel then had the same purchasing power as fifty cents or more would have today. Henning assumed that nobody would notice his fakes as they were only nickels. He made a mistake in choosing 1944, though, because he wasn't aware that date should have a large mintmark on the reverse, even for Philadelphia minted coins (which carried no mintmark at that time). Henning's counterfeits had no mintmark. If you find a 1944 nickel without a mintmark, it's a Henning counterfeit. Interestingly, although the FBI siezed what they could when they arrested Henning, they seem to be uninterested in these coins when they appear for sale today. A diagnostic for Henning nickels of any date is a messed up "R" on the reverse. However, Henning claimed to have made 6 reverse dies and 6 obverse dies. Not all have that screwy "R". Some other clues are that a Henning may be overweight (significantly more than 5 grams), though not all are. Henning nickels are porous looking, lacking detail and may lack full rims. Some have raised dots inside the "M" of "UNUM"
Supposedly Henning branched out to other dates because when he took some of his first efforts to the bank, a teller commented that it was odd that all the dates were the same. Having the extra expense of more dies may have upset his profit margins; after conviction he is said to have claimed that he actually lost money overall. He may have made a half million of these. When he learned that the FBI suspected him, he supposedly dumped his dies and some 200,000 coins in a river. The FBI only recovered 14,000. Henning paid a $5,000 fine ($40,000 or so in today's money) and was sentenced to three years in prison (and apparently three more for counterfeiting five dollar bills!). If he did make six obverse dies and they were different dates, we only know of five, so it is possible that another year could be discovered. 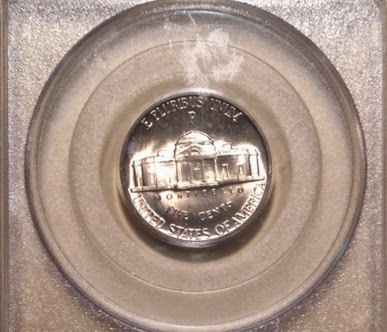 Any 1956 nickel you own might have been made from blanks seized at the time of his arrest, melted and reused by the Mint. Oddly, you can find these offered for sale today. Apparently the FBI isn't concerned with small change now.. They aren't much interested in criminal charges either. They'd rather see the whales continue to pay fines than do time. Henning's blanks weren't used directly by the mint. After seizure they were melted and remixed to appropriate levels of copper and nickel.